It took about a month into living in my first apartment in New York City to realize I had lucked into one of the greatest luxuries a New Yorker could have – A backyard and covered patio. The first thing I purchased for it was a charcoal grill which I used year round. I was used to bundling up during the winter because I walked everywhere and road the subway, I actually thought it was fun standing around a warm grill loaded with goodies on the patio during the winter. 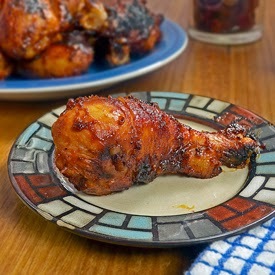 I grilled everything, but one item became my specialty early on – barbecued chicken legs. For this recipe, I make a batch of chicken legs like I used to on my patio in New York. I start by marinating them in buttermilk to tenderize the meat. Next, I rub the legs with seasoning that is seared into a crust during the first part of grilling. Finally, I start basting the legs with barbecue sauce after each turn, which creates blackened spots of caramelized sugar on the legs that are loaded with flavor. The end result is moist meat with a thick and sticky barbecue coating, guaranteed to make a delicious mess. By the time this chicken is finished cooking it looks burnt, but it really is not. 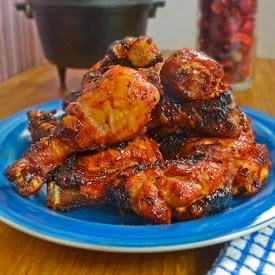 The sugars in the rub and barbecue sauce caramelize and blacken but the continued basting doesn’t allow it to dry up, creating a fond on the skin of the chicken. I had a lot of this left over and I shared it with Mom and Dad the next day. Upon first glance my Dad said “what’s that? burnt chicken.” All the skepticism went away after he had a taste because I think he ate 4 legs himself. The same thing happened at a party years back on the patio in New York, everyone kept complaining that I had ruined the chicken as it was nearing completion, those same people ended up eating there words as they devoured the huge mess that I had cooked up, but they were nice enough to apologized for not trusting my grilling skills. I have to say making this recipe brought back lots of great memories of my backyard paradise located at 36th Avenue and 29th Street in Astoria, Queens. I wonder who lives there now and I hope they have a charcoal grill – I know I did and it put me on the culinary path to where I am today. Place chicken in bowl and completely submerge in buttermilk, cover and refrigerate. Let chicken marinate 4 to 12 hours. Remove chicken from bowl and rinse, then pat dry with paper towels. In a sauce pan over medium heat, sauté onions in a little olive oil until soft, 3 to 4 minutes. Add garlic and cook one minute more. Stir in ketchup, brown sugar, sriracha, cider vinegar, chipotle pepper, dijon mustard, honey, liquid smoke and worcestershire sauce and bring to a simmer stirring often. Remove from heat and let cool. In a bowl, mix together smoked paprika, sugar, mustard powder, salt, black pepper, garlic powder, onion powder and cayenne pepper. Librally sprinkle over chicken and rub in with hands. 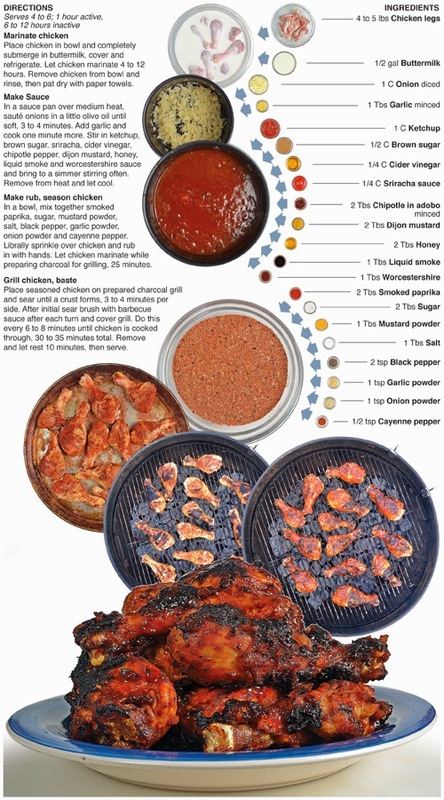 Let chicken marinate while preparing charcoal for grilling, 25 minutes. 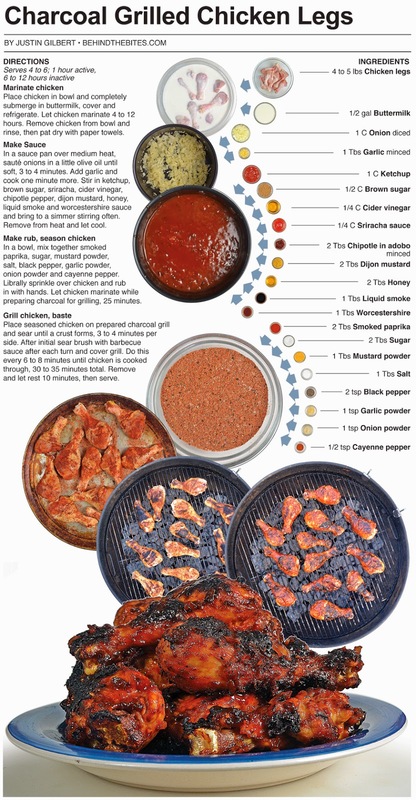 Place seasoned chicken on prepared charcoal grill and sear until a crust forms, 3 to 4 minutes per side. After initial sear brush with barbecue sauce after each turn and cover grill. Do this every 6 to 8 minutes until chicken is cooked through, 30 to 35 minutes total. Remove and let rest 10 minutes, then serve.